In 1540, the Spanish conquistador Coronado trekked through the area known today as New Mexico in search of the fabled seven cities of gold. Did he find them? Only you will be able to determine that as you visit Carlsbad, Albuquerque, Santa Fe, Los Alamos, Roswell, Cerrillos and Farmington. Now called the Land of Enchantment, New Mexico was one of the last states to enter the Union in 1912. Before that it remained a part of the Old West, a place known for cowboys, cattle drives and the influence of the Apache Indians. The artwork and culture of the Native American presence is still very alive in the artwork and culture that will surround you in each of the cities. The capital city, Santa Fe, founded in 1610, has the oldest continually used seat of government in North America. Its central plaza is constructed of traditional adobe, making the city look as if it has been transported from the old Spanish colonies. The Cliff Dwellers’ homes at Mesa Verde National Park go back even farther too around 1200 AD. After they were discovered by farmers looking for additional water sources in the region, President Theodore Roosevelt soon recognized the value of the historic treasure and created the first National Park devoted to heritage. Los Alamos, with its Bradbury Science Museum, has been at the cutting edge of America since the 1940s. In addition, each of the cities has wonderful natural areas and outdoor environments waiting for exploration. 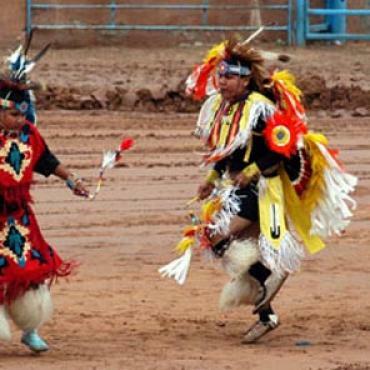 Albuquerque is filled with worthy things to do, whether your primary interest is Native American culture, Southwestern culture or nature. 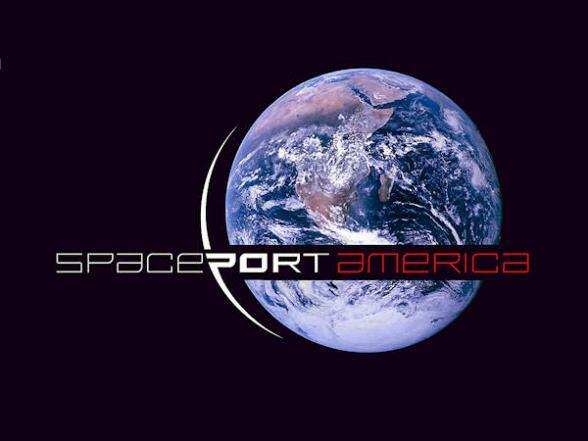 The top attractions include the Albuquerque Biological Park, the home to the Albuquerque Aquarium, Rio Grande Botanical Gardens, Rio Grande Zoo and Tingley Beach, the New Mexico Museum of Natural History and Science, the National Atomic Museum, the Indian Pueblo Cultural Centre and the Rio Grande Nature Centre. The lush Botanic Garden, which encompasses 36 acres and a 10,000 square foot glass conservatory is an oasis in the New Mexico desert. The Aquarium takes visitors on a journey down the Rio Grande from Albuquerque to its mouth at the Gulf of Mexico. The New Mexico Museum of Natural History and Science is also home to the Lode Star Astronomy Centre. 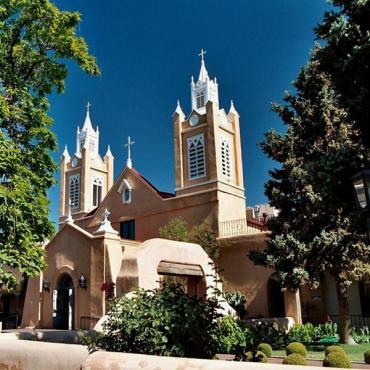 The views are spectacular from the Sandia Peak Aerial Tram and the Plaza to Plaza Walking Tour that takes you from Albuquerque’s original Plaza in Old Town to the new Plaza in the contemporary section of downtown. You also have the option to take a drive on the Turquoise Trail National Scenic Byway which takes you out into the byways and back roads around Albuquerque. 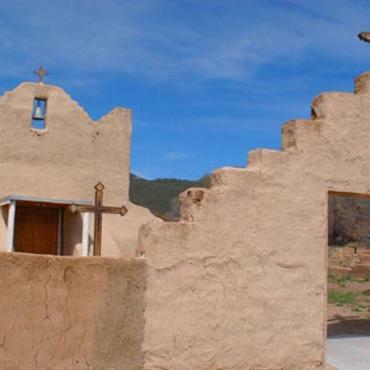 Founded in 1610 by Spanish explorers, Santa Fe is the most European of American cities. 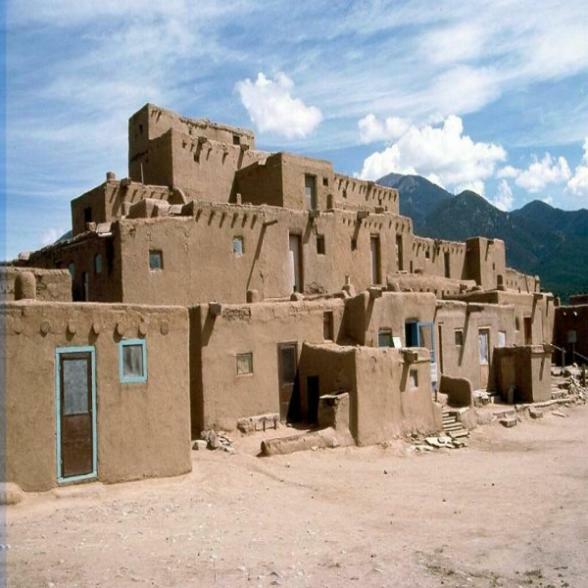 Inhabited by Pueblo Indians for centuries before the Spanish arrived, its architecture is adobe, its pace slow and civilized, and its air crisp, clean and dry. Long before the English landed on Plymouth Rock, the city, located at the other end of Camino Real, the Royal Road from Mexico City, was a centre of commerce, trade and culture. Later, thousands of European settlers travelling across America on the Santa Fe Trail poured in from the Midwest, seeking a better life in the gold rush era of the desert southwest. 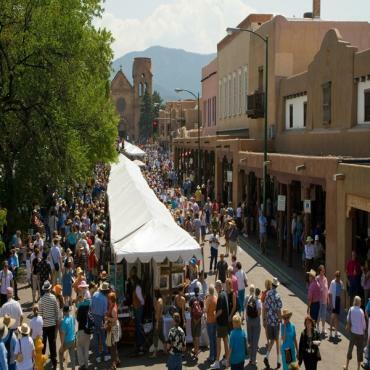 Today, Santa Fe is a combination of all those cultures, having taken the best from each. It’s come a long way from the days when Father Lamy was sent by the Pope to tame the wildest of the Wild, Wild West. Thriving under the Spanish, Native American, Mexican, Territorial government, American Confederates (one wonders how the struggle for independence by the South got so farafield) and ultimately Union rule, it took over three hundred years for the city to emerge as the oldest state capital in the United States. The Plaza, in the centre of town and once filled with traders and wagon trains, is now home to art galleries, sophisticated restaurants and unique shops. Original Spanish architecture from the 1600’s surrounds the central square, including the oldest continuously occupied public building in the nation. Santa Fe is world renowned for its cultural attractions and art galleries. Some of the best offerings include the Museum of Spanish Colonial Art, the Wheelwright Museum of the American Indian, the Museum of Indian Arts and Culture, the Georgia O’Keefe Museum, and the World Folk Art, with diverse works from artisans all over the world. If that’s not enough, there a huge list of art galleries, a myriad of restaurants and other interesting shops. Enjoy whatever you choose to do, there is more than enough to fill two days. 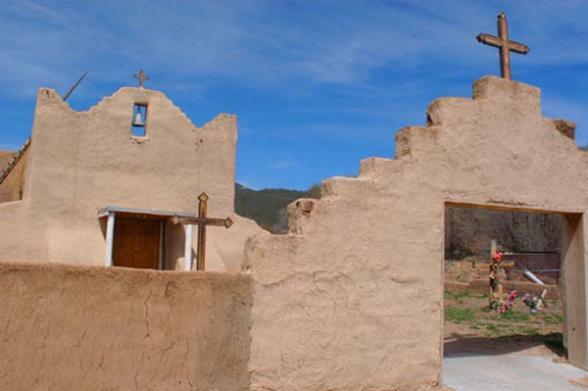 Today, we suggest you drive between Santa Fe and Taos via the Enchanted Circle Scenic Byway. The road circles Wheeler Peak, the highest mountain in New Mexico. Venturing off at Eagle Nest will take you to Cimmarron Canyon State Park where palisade cliffs and clear running waters are filled with wildlife. Until recently, the Park was almost exclusively used by hunters and fisherman until the spectacular scenery was discovered by hikers and wildlife enthusiasts. Spending another night in Taos will enable you to take a trip on the Cumbres and Toltec Scenic Railroad. You’ll have to get a very early start since all trains leave from Chama at 10AM. It will take a little over two hours to drive between Taos and Chama, even though it’s only 90 miles. Along the way you will be passing the Rio Grande Gorge and travelling over the Rio Grande Bridge. The road is a Scenic Byway from Tres Piedral to Tierra Amarailla. Between there and Chama, you’ll be passing the Brazos Cliffs. The Cumbres and Toltec Scenic Railroad is the last full operational main line section of the Denver and Rio Grande Railroad which once connected the outposts of the southwest. The trips take you back into country that is not reachable any other way than by train. From there, it’s a short drive over the Cumbres Pass to Dulce and your accommodations for the evening. Tucumcari, once nicknamed Six-Shooter Siding, got its start in 1901 as a rowdy railroad camp filled with saloons and outlaws. Soon, it became one of the many small railroad towns in the southwest with a flagging economy and diminishing population. 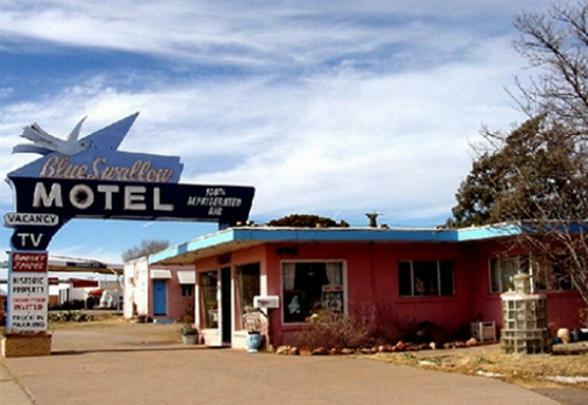 Today, Route 66 is critically important, since it was the new businesses that were established along Route 66 which allowed Tucumcari to hang on when other towns failed completely. Realizing that they have one of a handful of authentic roadside towns still intact and thriving has promoted a renaissance and revival among the gentlemen and businesses who just refused to let this wonderful piece of Americana and the American road trip pass away entirely. 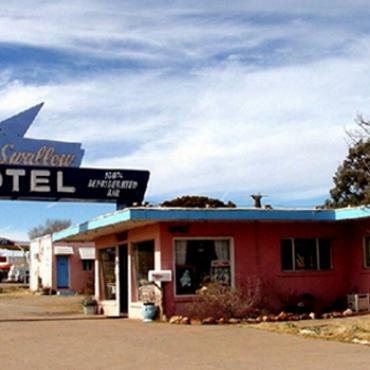 Let the signs that read Tucumcari Tonight, beckon you to this interesting place. Be sure to take the tour of the 20 murals throughout town that tell the story of this unique destination. The story of Carlsbad Caverns began 250 million years ago on a 400 mile long reef and inland sea that covered this region. Eventually the sea evaporated and the reef was buried under deposits of salts and gypsum. A few million years ago, uplift and erosion of the area began to uncover the buried rock reef. Rainwater, made slightly acidic from the air and soil, seeped down into the cracks slowly dissolving the limestone, beginning the process that would form large underground chambers. 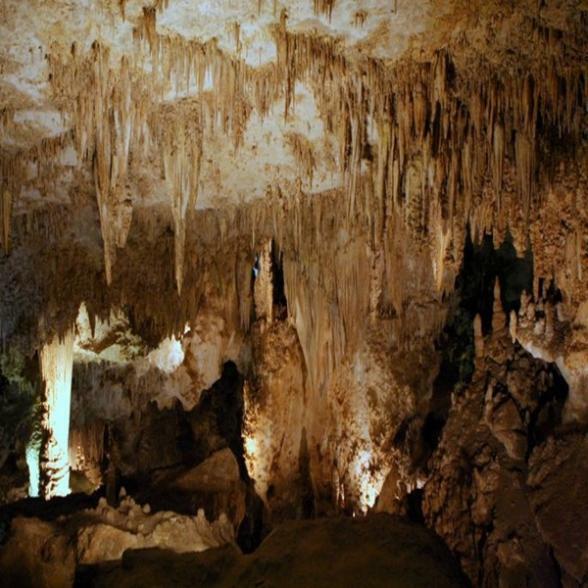 The exposed reef became part of the Guadalupe Mountains and the underground chambers became the wonder of Carlsbad Cavern. More than 1,000 years ago prehistoric Native Americans ventured into Carlsbad Cavern leaving behind mysterious drawings on cave walls near the natural entrance. Much later settlers were drawn to the cavern by the spectacle of hundreds of thousands of bats rising up out of the natural entrance in the evening. After Cowboy Jim White spent hour after hour exploring the cave with a photographer in tow, Americans finally realized the natural wonders of this huge underground wilderness full of unusual cave formations. 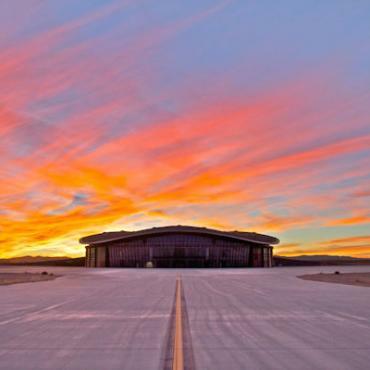 It took photographs to convince skeptics that Carlsbad Caverns was everything it was said to be and more. Some are convinced that an Unidentified Flying Object landed in Roswell, New Mexico in 1947 with several aliens aboard. 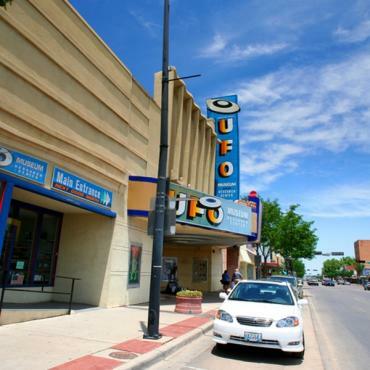 Roswell would be a sleepy Western town if it were not for this event. The town has never been the same since. The actual evidence is locked away somewhere secret. Roswell has created a Museum to feature this unique American event and complemented it with the Crash Down Diner, and its sister Crash Site Café. The streetlights on Main Street have slanty alien eyes painted on their bulbous globes which glow green at night. There’s even the Flying Saucer McDonald’s. 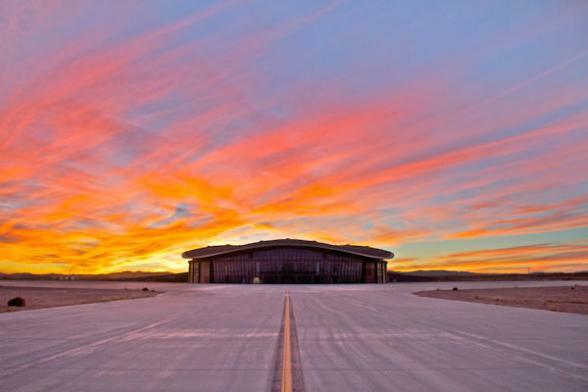 Fortunately, Roswell also has the Roswell Museum and Art Centre, Bottomless Lakes State Park and the Historical Centre for Southeastern New Mexico to round out the region’s story. 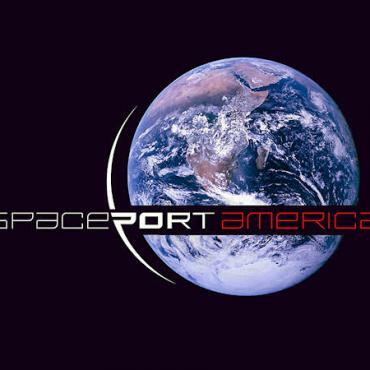 En route to Albuquerque from Roswell you may want to stop at a town called Truth or Consequences, as it's from here that we can offer tours to view the terminal at Spaceport America - the world's first purpose built commercial spaceport. Alternatively, head onto to Albuquerque for more time exploring this wonderful multicultural city. This is your last day before heading back home, however your journey doesn't have to end here. 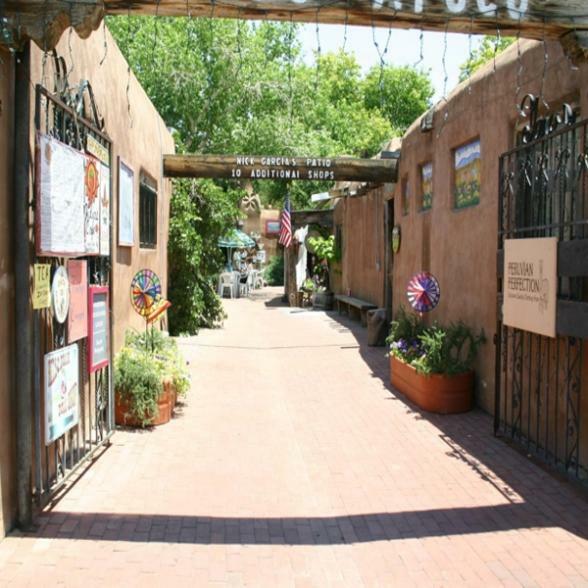 Why not extend your tour and spend a few more days exploring Albuquerque or perhaps you may want to fly over to California for some shopping and relaxation? 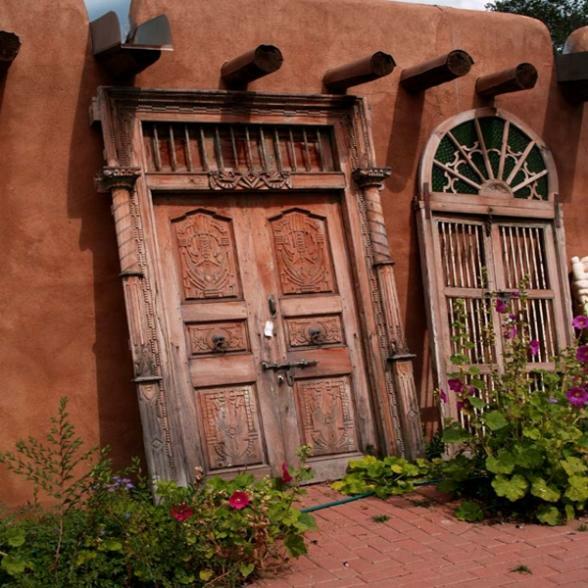 Call the travel experts at Bon Voyage to discuss your dream Land of Enchantment journey.